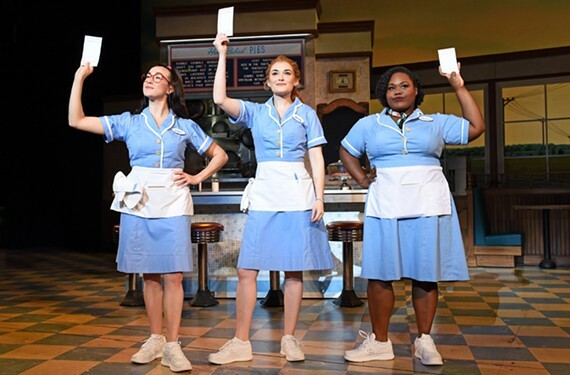 The Broadway musical hit "Waitress" comes to Richmond with olfactory delights | Theater | Style Weekly - Richmond, VA local news, arts, and events. Jessie Shelton, Christine Dwyer and Tatiana Lofton. 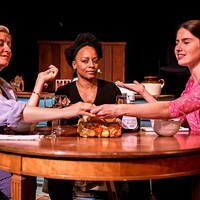 On certain nights, when conditions are just right, actress Jessie Shelton has a sensory experience onstage that's unique to the musical "Waitress": the smell of freshly baked pie. Just as in the Broadway staging, the traveling production of "Waitress" has slices of pie for sale before the show and during intermission. Depending on the theater, Shelton says she can smell the pie in the audience as she performs. Pie is nearly a character unto itself in "Waitress," a show based on the 2007 Keri Russell film of the same name. The musical centers on Jenna, a waitress in an abusive relationship who becomes pregnant. Skilled with a rolling pin, Jenna hopes to bake her way into a new life by winning a pie competition. 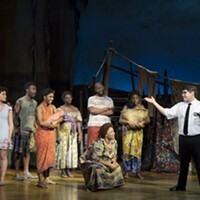 Featuring music from singer and songwriter Sara Bareilles, the show has been a Broadway hit since it opened nearly three years ago. "It's following the journey of a very strong but very mixed-up woman," says Shelton, who plays Jenna's colleague Dawn in the traveling production coming to the Altria Theatre next week. "In the end, she finds the strength within herself to make her own decisions." In playing Dawn, an anxious waitress who's never had a boyfriend, Shelton gets some of the show's funniest moments, exemplified by her nervous number "When He Sees Me." In the number, Dawn runs through all variety of potentially terrible outcomes of an upcoming date. "She's neurotic and sweet and tries to do her best," Shelton says. "She has her own systems of operation, but she opens up over the course of the show." While the show focuses on Jenna's trials and tribulations — including an affair with her affable gynecologist — the other lead characters have their own stories to tell. For Dawn, that involves courting Ogie, an equally nerdy man who enjoys taking part in Revolutionary War re-enactments. "She too has a fantastic arc of growing and embracing all of the possibilities that life has to offer, and it's a lot of fun," she says. 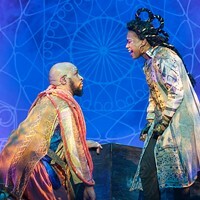 "How many times do you get to dress up in Revolutionary garb, get married and support your best friends in one show?" One of Shelton's favorite moments is the number "Soft Place to Land," where Jenna, Dawn and sassy co-worker Becky sing about their dreams. 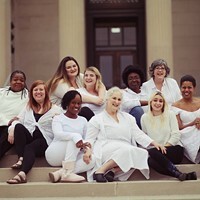 "It's a beautiful, heartfelt moment in which the show kind of slows down a little bit and you just get to absorb this moment of togetherness and hope," she says. Throughout the musical, Jenna creates a multitude of experimental pastries, including passion fruit and milk chocolate pie and a Pursuit of Happiness Pie. "It's a kind of patriotic pie with a whipped cream and berry situation, which is always awesome," explains Shelton, adding that a cookbook featuring recipes for the show's pie is for sale in the lobby. Little pies — salted caramel chocolate and apple crumble for Richmond — will be sold in Mason jars by costumed waitresses. "Whether you're a baker or not, you can participate in the pie situation." While there is plenty of fun and funny moments, Shelton says the show never loses sight of its focus on its female protagonists, and notes that the creative team that produced "Waitress" is female. Though it deals with real-life issues, Shelton says it still provides a bit of escapism and hope for audience members. "With all the stuff going on in the world right now, to be able to see a redeeming and empowering story, if you're open to it, is inspiring," she says. "Stop and smell the pie." 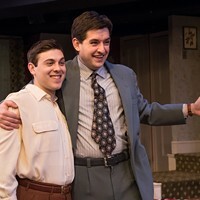 "Waitress" plays Feb. 12-16 at the Altria Theatre, 6 N. Laurel St. For information, visit broadwayinrichmond.com or call 1-800-514-3849.